Back in the 1970's an Occupational Therapist, Joy Robinson, started up a Lunch Club based in a modular building known as the Homecraft Centre, half of which had been a domestic science classroom, on the edge of the secondary school campus. Around the same time a Social Worker, Ken Wilson, also began a Day Centre for the elderly which was based in the Adult Common Room at Sawtry Village Academy (then the Village College). In 1982, both clubs came under threat as decisions were made to move the founders on. A number of local individuals decided to form a committee to save the projects and the 'Sawtry & District Care and Resource Organisation' (more commonly known as CARESCO) was born. In November 1983 this new organisation was registered as charity number 288202 with the Charity Commission. In 1986 CARESCO also took over the Manpower Services Print Shop which occupied the other half of the old building and thus the Homecraft Centre became headquarters with office space for the charity's first Organiser, Marjorie Dybeck. Erected in 1966, the Homecraft Centre served us well until the 1990's by which time it had become very run down, badly vandalised and eventually almost uninhabitable. In 2000 CARESCO was successful in getting a lottery grant from the Community Fund for just under £120,000 to pay for a replacement modular building. Purpose built, the new CARESCO Centre is on land leased from Sawtry Community College and adjoining the car park behind the Parish Council-owned Old School Hall on Green End Road. The site is about 100 yards from where the old Homecraft Centre stood. The CARESCO Centre was opened in April 2001 and is used by all the current activities with the exception of the Alconbury Thursday Club and the Charity Shop. Following a spate of vandalism, a security fence was erected around the back and side of the Centre, which enabled us to plant a garden in 2005 for the enjoyment of our users, volunteers and staff. In 2010 the decision was made by the management committee to change the legal status of CARESCO to that of an incorporated charity. This is a normal procedure for organisations of a similar size and a natural development building on all of the hard work in the past. So, on 1st April 2011, CARESCO changed to become a charitable company, that is both a registered charity (number 1140728) and a registered company (number 7513432). Although the change made no difference to the services provided to the community, CARESCO now has more secure foundations to enable the organisation to move forward with confidence. For more information about the history of CARESCO and details of how the organisation was set up and run in the early years, a book entitled 'The Story of CARESCO' is available. 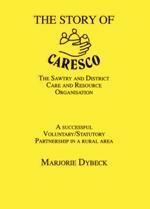 This was published in 1998 and written by Marjorie Dybeck, who was instrumental in the creation of CARESCO and was also the first Organiser. The book offers useful guidance to anyone interested in setting up a similar charity in their own area as well as a fascinating account of the charity's history. Foreword by the Rt Hon John Major, MP. Please contact us if you would like to order a copy of The Story of CARESCO.